Your web development career can be helped with a little self study. There are now a plethora of online courses available for major software tools, and you can use a book — or online resources that you stitch together — to develop your own miniature curriculum. This approach can end up being somewhere between the structure and networking potential of a college or university course and the more haphazard approach that most people take to on-the-job training (OJT). The difference between self-study and OJT is that self-study is time that you consciously set aside to delve into the workings of a software tool, without being driven by needing a particular trick or technique for the work immediately in front of you. Being able to spend a few hours in this more exploratory and reflective learning mode every so often, for each of the tools you use, is extremely valuable. It also makes you more productive and increases your feeling of satisfaction with your work. If you know a certain genre of software, you can pick up a different program in the same genre pretty easily through online courses and self-study. For instance, if you know Photoshop, learning the freeware alternative GIMP is not that hard. Quickly learning the key points of one new tool by using your knowledge of an existing tool of the same type is often a good technique to use to get up to speed before a job interview or the first day on a new job, but learning your first program of a given type requires more effort and commitment, such as an in-person course. Using self-study is also great when you are trying to learn about a tool — that is, exploring whether it’s something you want to add to your personal toolkit. You’ll often want to do this kind of exploration before committing to either purchasing a tool yourself or — perhaps just as big a commitment of your personal resources — getting your corporate IT department to approve it for purchase. 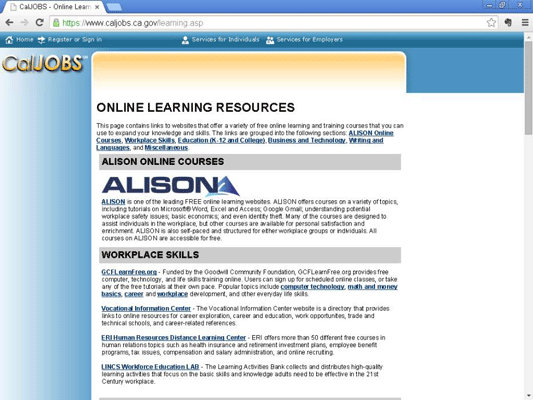 Here is a list of online learning resources for CalJOBS, an employment website for California. The licensing situation for online courses and self-study is often poor. Many tools give you a free month, for instance, of using a tool before you buy it. That’s helpful, but it leaves you rushing to do your experimentation or use it before the month is up. And you might then have a difficult decision to make as to whether to buy the software or give up on it. Having monthly licenses available, as more and more web design software does, certainly helps. But there’s no ideal solution for getting new tools into your personal toolkit.